We halfway through April, hurtling at an ever-increasing rate towards festival season. Before Glastonbury throws open its gates following two years off the schedule, and pretty much every single resident of the East London area descends on the newly (newly) relocated Field Day, last weekend saw hordes of #influencers – with varying levels of influence – land in the desert of Southern California for the first event of the year. That’s right: Coachella is upon us. With weekend one of the extravaganza down, we’ve already seen the likes of Childish Gambino, Aphex Twin, Billie Eilish, Christine and the Queens, and Ariana Grande, in her hugely anticipated Sunday night headline spot, take to the stage – and, on Friday we’re about to do it all over again. But, for better or worse, when it comes to Coachella, it’s as much about what you’re wearing as it is the music. And while there were plenty of fringed, boho dresses and flower crowns – the trend that just won’t quit! – there were plenty of people who served us some serious looks. Dev Hynes, performing as Blood Orange, went for one of Asai’s incredible Hot Wok tops, as worn underneath a denim all-in-one, while Cardi B showed up to perform a surprise set with Selena Gomez wearing a Medieval-inspired embroidered corset by McQueen. McQueen. In the desert. For real. Of all the people that showed up though, there was one who really stood out: step forward Lizzo. 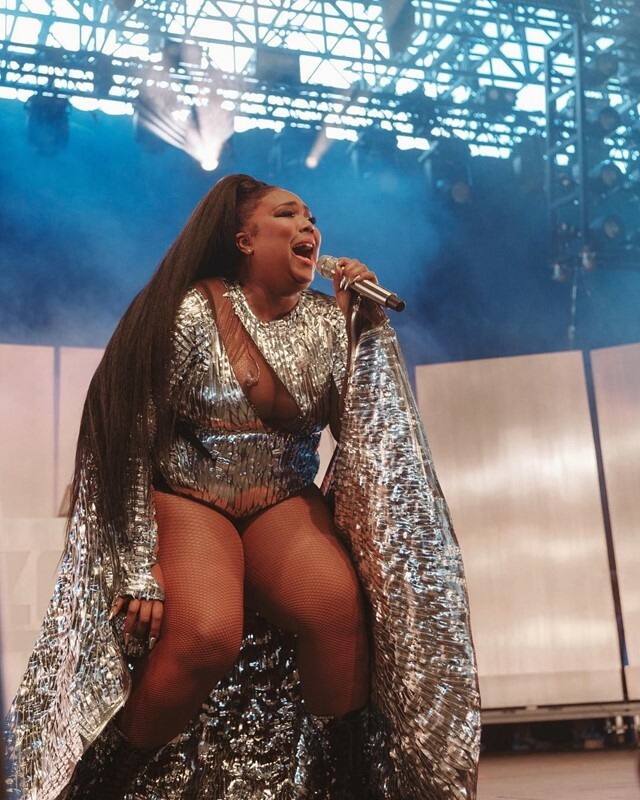 The “Juice” singer, whose album is due to be released this Friday (watch this space for more), arrived on stage looking like an IRL superhero, complete with silver sequinned cape and matching high-cut leotard. Between this and the fact she brought friend Janelle Monae out for a twerk-off, the set was soon dubbed #ASSCHELLA across social media. The look was the work of LA-based designer Brad Callahan, who has previously created a series of full-on fantasies for the boundary-pushing performer, as well as Nicki Minaj, Drag Race winner Aquaria, and Queen of the Club Kids herself, Susanne Bartsch under his label BCALLA. Callahan’s interest in fashion was sparked at a young age, when he found himself inspired by his older brother’s comic book collection, and more particularly, the ones with female leads, including Lady Death, Witchblade, and Dawn. It was in 2004 that he realised fashion was the direction he wanted to go in: “When I saw the Dior AW04 show, I knew exactly what I wanted to do with my life,” he recalls. As one of a small – but thankfully growing, albeit slowly – number of designers authentically creating for a wide and diverse range of body types and sizes, with his wildly fabulous, dramatic designs, Callahan is intent on changing the fashion landscape when it comes to inclusivity. “I’ve always been kind of a bigger guy, which has been a driving force behind my dedication to working with artists of all sizes,” he says. “My work is all about fantasy and the power clothes have to transform. BCALLA believes that fashion should be democratic and that everyone has the right to be a star. That’s the fantasy that my clothes are built on.” Amen to that.